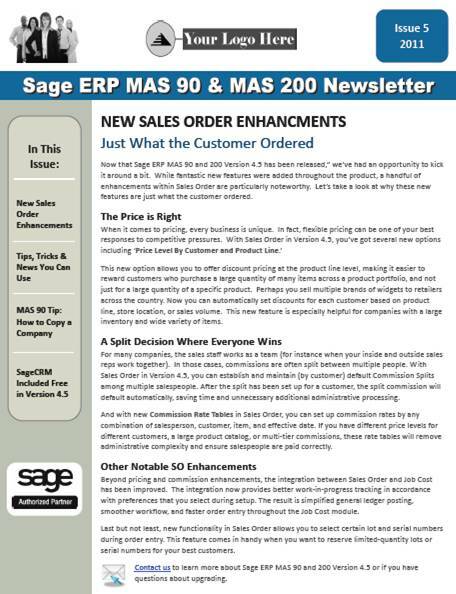 Juice Marketing has just published the first issue of our Sage ERP MAS 90 and MAS 200 newsletter for 2012- part of our Sage Newsletter Marketing program designed to help Sage Partners provide ongoing communication with customers and stay top of mind with prospects and alliance partners. – Is MAS 200 SQL Right for Me? Be sure to contact us if you’d like a copy of this newsletter to send to YOUR customers and prospects. We’ll personalize it with your logo and company colors and provide you with a formatted PDF, HTML email, and article content with each issue.